The Pope was accompanied by the Papal Nuncio Archbishop Jude Thaddeus Okolo as he pulled up to the tarmac at Dublin Airport in a blue Skoda after saying Mass in Phoenix Park. 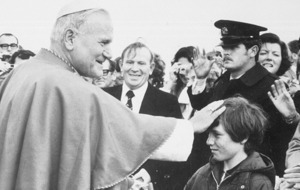 Pope Francis was greeted by Taoiseach Leo Varadkar and other dignitaries on the apron of the runway before his departure. Archbishop of Armagh Eamon Martin and Archbishop of Dublin Diarmuid Martin were among those in attendance. 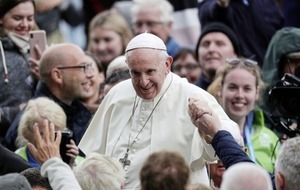 The Pontiff smiled and shook hands with many people before ascending the steps to reach Aer Lingus' St Aidan aircraft. At the door, the Pontiff paused, turned around, waved and blessed those who had come to say goodbye to him before heading inside. It marked the culmination of a whirlwind visit to the Republic by Francis. As the A321 jet pushed back from the runway, the papal flag and the tricolour were flown from the cockpit. Under the command of Captain Steve Kelly, it took off shortly before 7pm on Sunday carrying more than 120 people. Shortly after the Pope took off, Mr Varadkar tweeted that he welcomed Pope Francis's call for firm and decisive action when it came to addressing clerical sexual abuse. 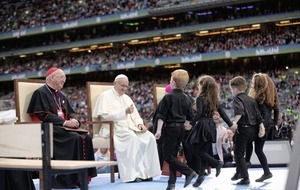 The taoiseach wrote: "We welcome Pope Francis's call for firm and decisive action and for forgiveness. "We now ask that from words flow actions. "We thank Pope Francis for his visit and ask for his prayers." The aircraft was slightly modified for the occasion: the Papal Coat of Arms was applied on the exterior, while inside divider curtains were installed. 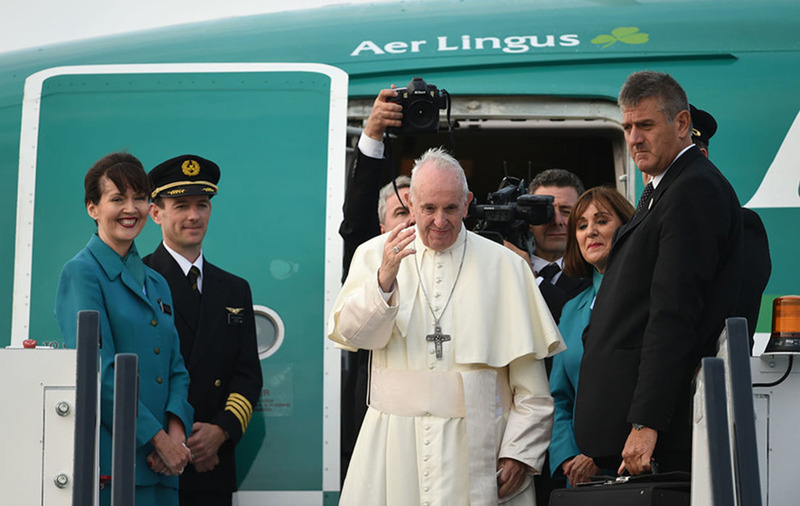 Aer Lingus offered the Pope a traditional Irish meal while on board. It included a starter of Toons Bridge mozzarella with a leek salad and Irish soda bread. For his main course he had a choice of baked smoked salmon with braised Savoy cabbage, glazed carrots and baby boiled potatoes or basil pesto risotto with roasted summer vegetables. A passion fruit mousse and Cocoa Atelier chocolate bites were served for dessert. Before landing in Rome, the pope was presented with two gifts by the airline, a model of Aer Lingus' first aircraft, the De Havilland, and a replica of the Celtic Crucifix of Athlone which was on board the aircraft which carried Pope John Paul II in 1979. The cross is one of the earliest Celtic Christian crosses found in Ireland and dates from around 800AD.